A lot of brewers may not be aware but when you take a hydrometer reading you do need to adjust for the temperature of the sample. Hydrometers are calibrated to work at a certain temperature, and readings taken outside of that range can be low or high depending on the temperature. 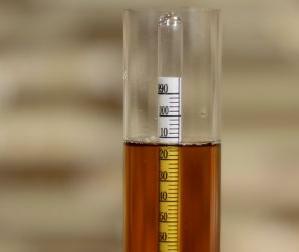 Hydrometers are used to measure the density of dissolved solids in our wort or beer. Most brewers use the specific gravity scale which is actually a dimensionless number that is a ratio of the density of the liquid to that of pure water which is defined to have a specific gravity of 1.000. Alcohol has a lower specific gravity than water which is one reason why your gravity goes down as wort ferments. Hydrometers are calibrated to work at a specific temperature. Most hydrometers are calibrated for a temperature of either 60 F (16C) or 68 F (20 C). The calibration temperature is usually printed on the scale of the hydrometer so it is important to check this when using your hydrometer. If you measure pure distilled water at the calibration temperature it should give you a reading of precisely 1.000. In fact its not a bad idea to check the calibration of your hydrometer as some inexpensive models are not well calibrated. If you measure a sample that is not at the calibration temperature with your hydrometer you will need to make an adjustment of the reading to compensate for the cold or hot temperature. This is particularly important when measuring hot wort like that from the mash, pre-boil or even post-boil. Your “into the boiler” raw measurement for gravity is very far off from the actual value. It can also be important for fermenting lagers. In BeerSmith (mobile or desktop) you can do this by going to the Hydrometer calculator on the Tools menu. 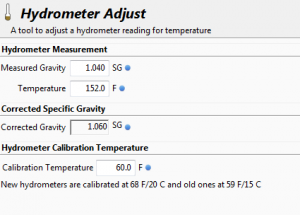 Here you can enter the measurement and temperature as well as set your hydrometer calibration temperature and BeerSmith will give you the corrected gravity. 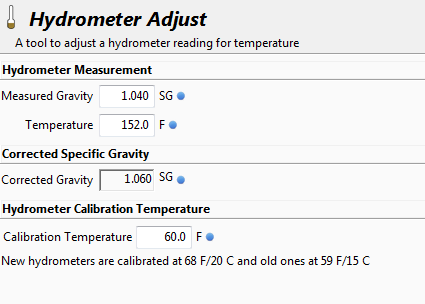 The measured gravity and sample temperature go at the top while the calibration temperature is at the bottom of the dialog. After you enter the values the Corrected Gravity field will show the adjusted reading. So that is a quick overview of how to measure hot or cold liquids using a hydrometer and BeerSmith. Thanks for joining me on the BeerSmith Home Brewing Blog. Be sure to sign up for my newsletter or my podcast (also on itunes…and youtube…and streaming radio station) for more great tips on homebrewing. Thank you for this post! The other weekend, when my partner and I were trying to measure the gravity of our beer, we were getting a really weird reading. It makes so much sense now knowing that the reading can change with temperatures. For any other tips, let me know! Thanks, Brad, good, short, easily digested reminder. I’ve had a graph on my brewery wall since the late ’90’s, and often need to add 1 or 2 points to my OG & FG. I appreciate that you bring up here that folks should do a calibration test with distilled water for their hydrometers. I had been using mine for months before I realized it has an offset of about +0.004. The good news there at least is that the offsets are linear, so if you know what it is then you can compensate for it (rather than having to trash the instrument). For example, when I take a reading, I sight the gravity, adjust for temperature and then subtract the 0.004 and boom — that’s my gravity.